If the name is confusing, say it out loud, like “Not ya Grandmother’s Toddy”. The joke isn’t funny if you explain it. I know. The hour is late so I’m going to make this a quick one. James had the idea to have a small tea party, in which all of our drinks would contain tea. I was greatly enthused by the idea, and we set about brainstorming some different ideas. In the brainstorming phase I thought, “this ingredient is going to be a snap!” But it turns out that tea is very subtle, and there are many opportunities for the drink to go horribly wrong. For our first drink we wanted to get some green tea in a glass with some hogo. The problem is that brewed tea has a very light flavor, and a tea syrup made in the usual way has a similarly light flavor. There was no way it was going to stand up to a high proof spirit! So the first thing I tried was brewing six cups of green tea, and then reducing it to roughly 2 cups. Making the reduction caused the tea to oxidize, and it lost both its green color and its grassy flavor. In fact, it started to taste like a black tea, but not like a good one. So we dumped that. 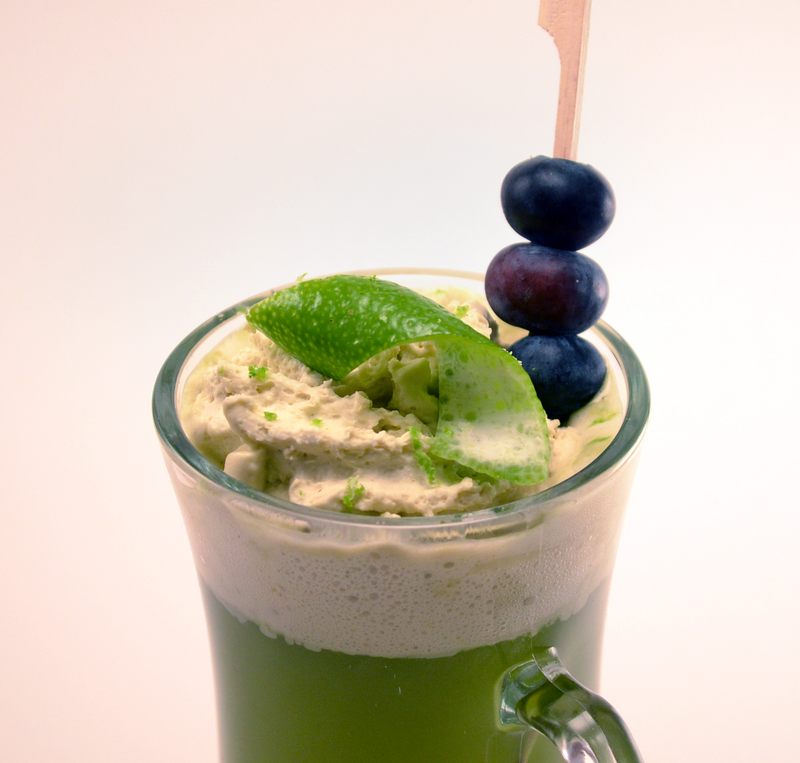 Fortunately, I had some matcha powder in my cabinet, and we were able to find a solution that was both flavorful and colorful. If you want to get the flavor of green tea in a drink, matcha is your best friend. A brief green tea infusion in vodka, pisco, or gin is another way, but I think matcha delivers the boldest and truest flavor of green tea. It is very bitter, however, and not in a delicious fernet kind of way. 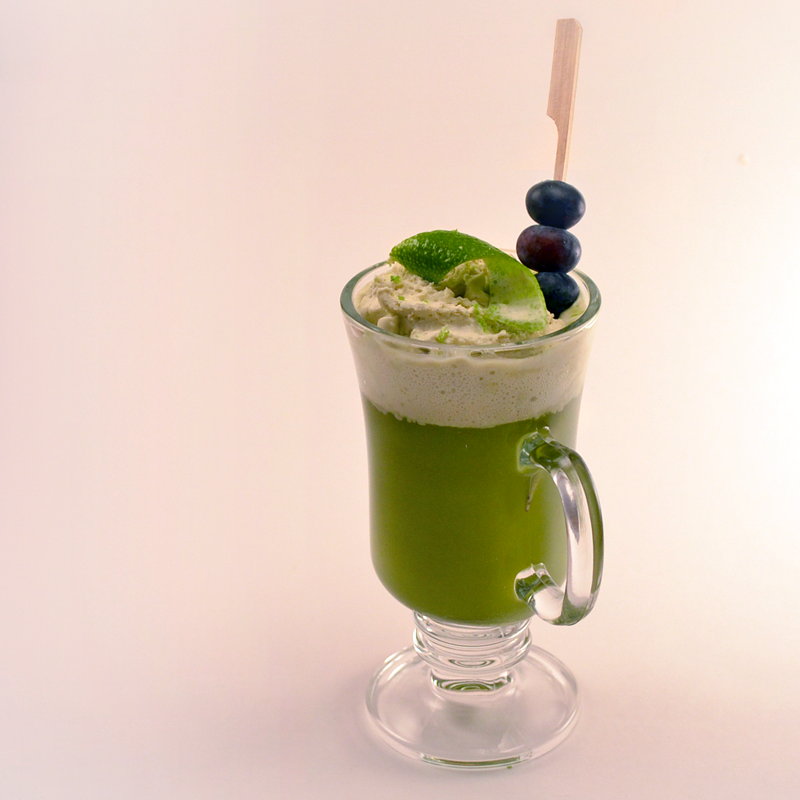 In a mixing glass, combine matcha, sugar, and boiling water. Stir vigorously. Add spirits and pour into a warmed irish coffee mug. Top with a matcha whipped cream*, lime twist, grated lime zest, and skewered blueberries. We ended up using cachaça instead of J. Wray, for it has a similar flavor, but it is not quite so pungent and overpowering. This is one of my favorite drinks to date, both in taste and appearance. I loved the sulfurous, vegetal funk of the cachaça against the grassy, floral tea, along with the bitter notes from the cocchi on the backend. Combine all in an iSi whipped cream dispenser, pressurize, and shake. Categories: modern drinks, original creations | Tags: alcohol, bartending, blueberries, booze, cachaca, cocchi, cocchi americano, cocktail, cocktails, craft cocktails, drinking, drinks, dry vermouth, green tea, hot toddy, lime, lime peel, lime zest, liqueur, liquor, matcha, mixed drinks, mixology, Quinquina, tea, toddy, whipped cream | Permalink. Wow what brilliant color! This looks very nice. The presentation and photos are freaking amazing! Definitely a must-try!